babus of india: Will Pitroda & Nilekani be able to do what ex-Ford Motor veteran McNamara did it to US admin? Will Pitroda & Nilekani be able to do what ex-Ford Motor veteran McNamara did it to US admin? IT CZAR Sam Pitroda’s appointment as the Advisor to Prime Minister Manmohan Singh on infrastructure, innovation and information after Infosys Technologies co-founder Nandan Nilekani’s appoitment as chairman of Unique Identification Authority of India (UIDAI) may bring in some changes the way the government functions. As both of these private sector honchos are pampered by giving the rank of a cabinet minister, a few more high profile private sector veterans may be attracted to join the government laterally. In fact, 68-year-old Pitroda, who is also the chairman of National Knowledge Commission, has prior experience in working with government though Mr Nilekani has no sarkari exposure earlier. No wonder, Mr Pitroda's talents were recognised during the NDA regime when he received Lal Bahadur Shastri National Award for excellence in Public Administration and Management Sciences. (See Picture with former PM A B Vajpayee and ex-President of India KR Narayanan) Significantly, post-retirement assignment of two senior bureaucrats in India, principal secretary to PM TKA Nair and national security advisor MK Narayanan hold the rank of ministers of state only implying that Dr Singh has attached much importance to both these specialists by according cabinet minister’s rank. The big question here is whether Mr Pitroda and Mr Nilekani could do what former president of Ford Motor Company Robert McNamara did to the US administration in 1960s when he was made Defense Secretary under President Kennedy. As was acknowledged in a sub-section called Reforms in Public Administration in the USA, one of the reports of the Second Administrative Reforms Commission has mentioned how Mr McNamara introduced the culture of questioning all assumptions and assertions, of quantifying costs and benefits, of using techniques like project evaluation and review (PERT) and critical path method (CPM) to cut costs and delivery times of projects, the use of mathematical techniques for optimizing resource allocation (operations research), network planning, value engineering, and a detailed planning, programming, and budgeting system. No wonder, the managerial culture introduced by Mr McNamara gradually spread to several other departments of US federal government! Straight From Files TKA Nair’s advice to Nilekani on project implementation (September 16, 2009) Action & Appointments a) Alok Prasad, a 1974 batch IFS officer and currently India’s envoy to Sri Lanka, has been appointed as deputy National Security Adviser. Prasad will hold the office for two years or until further orders, according to the decision of the ACC. He was also India’s High Commissioner in Singapore and deputy Chief of Mission at the Embassy of India, Washington from 2000 to 2004. b) Former finance secretary and chairman of Thirteenth Finance Commission Dr Vijay Kelkar has unanimously been elected as chairman of the Forum of Federations, an international organization headquartered in Ottawa. It seeks to strengthen democratic governance by promoting dialogue on the practices, principles, and possibilities of federalism through partner governments, a government release said on Thursday. c) Avinash K Srivastava, joint secretary in the ministry of corporate affairs has been nominated as the official spokesperson of the ministry for interacting with the media representatives. He is a 1982 batch UP cadre IAS. Its heartening to see the lateral induction of such brightest of talents viz. 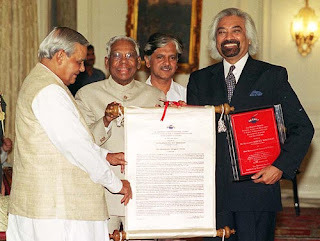 Pitroda and brigade into policy making at the apex level. But lets not denigrade the babudom which is indeed rich with brightest of talents who are making a positive dent in our life.